Just when I thought I had seen all that there was to see in the iOS stylus market, Adonit has come out with something that took me by surprise. And in the coming months, I imagine the company will be surprising a whole bunch of other people, too. On Wednesday at the International Consumer Electronics Show in Las Vegas, I was lucky enough to test-drive a prototype of the company’s new pressure-sensitive stylus, the Jot Touch. Even with limited drawing time, I came away with incredibly positive impressions. Like the Jot Pro, the Touch has a steel-and-rubber body with a small plastic disk for a nib. This stylus, however, will be fully pressure sensitive, thanks to a built-in Bluetooth antenna, smaller-diameter spring tip, and free software development kit for app implementation. But unlike some of the faux-pressure solutions of the past, the hardware component is just as important as the software: The Jot Touch communicates the level of pressure from the spring-tip to your iOS device via Bluetooth, no dock connector required. 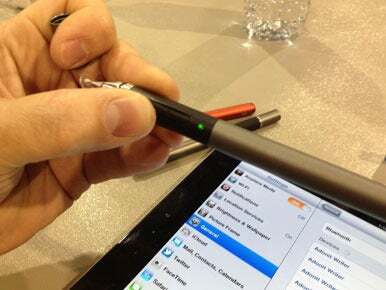 The pen charges magnetically through a tiny USB dongle. Sperry estimates that the pen should last 12 hours on a single charge under Bluetooth 3.0, with that estimate likely to double once Apple implements the Bluetooth 4.0 standard. This all sounds impressive, sure, but does the pen hold up where it really matters—when drawing or writing? My quick test returned a resounding yes. While the Adonit team is still tweaking the exact balance between how hard you press to make the resulting lines, even their early prototype works as advertised. The new, springier nib not only makes it feel like you’re drawing and tapping on an actual surface, rather than a screen—the lines don’t lie. When I traced the pen over the screen lightly, I received a thin, pale line; added pressure, and the line darkened and widened. It’s not quite like working with a Wacom tablet, but it’s insanely close. Adonit is aiming for the Touch to be out in March, with a price tag less than $100.